That’s Not A Bike… THAT’S A Bike! 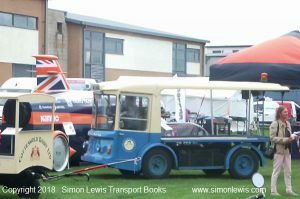 The display of ancient electric milkfloats were slowly lining up into bizarre juxtaposition alongside the BLOODHOUND SSC Land Speed Record car at Tewkesbury Classic Car event (OK, it was the mock-up…but you get the idea..) . And very bizarre this was, but it wasn’t the most memorable thing we saw that day on the school playing field-turned car park. Sat with my daughter Charlotte on our wind-blown bookstand hoping that the dark clouds racing overhead would clear off quick, we heard something approach that sounded rather like a mobile kettle drum being tuned up before Trooping The Colour. Into view appeared a huge red motorcycle. So big that the rider hanging off the back still seemed to be trying to reach it’s summit . And failing. 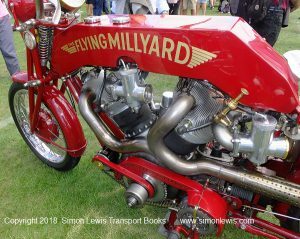 Enter the FLYING MILLYARD, a creation from the fertile imagination of Allen Millyard, a man who’s previous motorcycle featured a Dodge Viper engine, which has a mere ten cylinders! 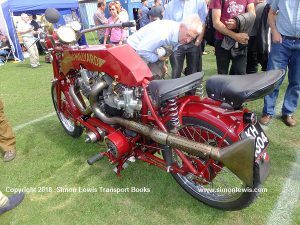 This one has 8 fewer, but they come from a Pratt and Whitney R1340 aero engine, the barrels of which have been grafter onto a handmade crank case to produce a 5 litre V twin which sits in a frame that with the wheels in place creates a bike some 8 feet long and 4 feet high! The full 9 cylinder, aircooled P&W ‘Wasp ‘radial engine would originally have been fitted into a Boeing 247, a DeHavilland Otter or even a Sikorsky H19 helicopter. 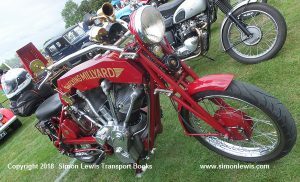 I guess no onbe on the original team even gave a two wheeled application any thought! 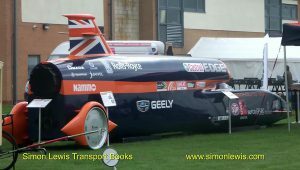 And that segue’s into the BLOODHOUND SSC mock up (below). That was clearly not ‘a knife’ but who cares? It certainly drew a crowd and hopefully attracted some new supporters “on the playing fields of Tewkesbury” . I can’t wait to see the real blade (below) in action (next year ?) 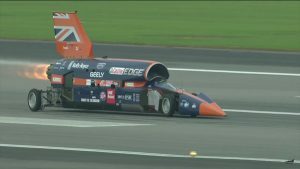 scything across the dry lake bed in South Africa heading for 1000mph.